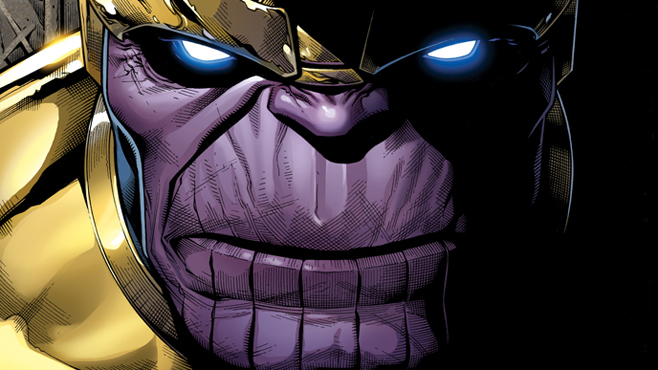 Marvel’s Infinity – Thanos is Back! Everything Dies! Any time Thanos the Mad Titan, Marvel’s cosmic powerhouse of a destroyer, is involved in a major event, it’s a safe bet that the story is going to be at least a little bit awesome. What makes Infinity a cut above, though, is the fact that Thanos – he of “I’ve destroyed half of all of existence in order to impress the lady embodiment of death” fame – isn’t even the biggest threat for much of the event! In the hands of Marvel NOW! Avengers architect Jonathan Hickman, Infinity is a rollicking, high stakes mega-event that lives up to the size and scope of Marvel event hype. Although the primary Marvel universe has certainly dealt with space before (Secret Invasion, World War Hulk (kinda)), Infinity is the first modern mega-event to really weave the Marvel cosmic universe into the fabric of earth-bound heroes such as Captain America. Infinity could have derailed very easily, but the end result is a tightly wound epic meticulously plotted out over the course of three primary titles: Infinity, Avengers, & New Avengers. As is my lot with these reading guides, you’ll see all relevant crossovers and tie-ins below. Keep in mind with Infinity, that if you stick to the three primary Avengers titles, you will get the most cohesive narrative (all three are written by Hickman). You’ll also find Inhumanity, a semi-event that reads as more of an epilogue to Infinity, at the end of this guide. As always, if you have any questions or concerns about this list, I can be reached here. Enjoy! Super Previous: The Complete Thanos Reading Order! Not so much a tie-in as it is the “origin” of Thanos. It’s also one of the worst Thanos comics I’ve ever read in my life. I list it here simply for the sake of completion – if you’re unclear who Thanos is, I’d recommend you actually start with Silver Surfer: The Rebirth of Thanos. These four issues of Avengers are officially labeled “Prelude to Infinity.” In reality, Jonathan Hickman’s entire Avengers run to date has been a set-up for this moment, and if you have a Marvel Unlimited account, or a desire for completion, I’d really recommend you read the initial Avengers issues as well. Hickman’s approach doesn’t exactly lead to your father’s Avengers, so you’ll be much better suited for these prelude issues and Infinity if you’re aware of the new team dynamics and discoveries. Couple notes here. First, this issue is labeled “Prelude to Infinity” as well. Nonetheless, I’d read this after the first main Infinity issue, as the ending here occurs clearly after the events of Infinity have begun. Second, New Avengers follows the same logic as Hickman’s Avengers. The whole series has led to the moment of Infinity and will be referenced throughout. You can catch up starting here. Just a word of warning, this one’s not much of a tie-in until the very end. An interesting concept that’s unfortunately tedious despite writing from Mind Mgmt’s Matt Kindt. If you’re going to engage with it, I’d just knock the whole thing out at once. Events here occur during the events of Infinity #3. There’s some overlap, but I prefer to get my story from the main arc and then fill in the details with this Captain Marvel issue. Trade collection released June 17, 2014. I pretty much stayed the course with the three main comics mentioned: Avengers, Avengers Assembly, and Infinity. I also read Captain Marvel (2013) for her viewpoint that was easily missed in the others. What a ride. I followed the timeline in the comics and found this list afterward. Clearly I missed something. But i feel i got a majority of the story. Is there a good “prelude to Infinity”? I picked up the trade and started reading it, and I’m all kinds of lost. Apparently there’s worlds colliding, the Illuminati is up to no good, Iron Man has a space suit, Richard’s family is somewhere far away, Attilan is over New York City, and Wakanda is not-quite-at-war with Atlantis? The only one of those I understand is the Wakanda/Atlantis bit, from Avengers vs. X-Men. What should I read to explain the rest? Check out the Marvel Now guide for more on Spider-Man. The Original Sin reference must be used in another context, there’s no way that’s about the Marvel event (published in 2014). JUST NOT SURE THE ORDER. I STARTED WITH THE END BUT NOT SURE WHAT TO PICK UP NEXT. ALSO AM I MISSING ANYTHING?? They call it an inhumanity prelude, but it has basically no connection. I’d only recommend if you’re into Indestructible Hulk as a whole series. It is part of the history, right? or its so superficial that i can leave it? ?